Standing before the crowd assembled in Portland’s Hollywood Theatre, filmmaker and former Clackamas student Devin Graham glowed with excitement. This was his night – his film. After months of shooting, several complete plot overhauls and enough frustration to kill a promising career, it was suddenly all worthwhile. Though he had experimented with movies before, Graham first realized his passion for film during a church mission trip to Jamaica. Allowing the idea to take root, Graham set out turning a burgeoning dream into reality. He recruited family and friends (and friends of friends) to help with a variety of different projects with which to hone his skills. Among other things, he completed a film about miniature people that relied heavily on green screen, shot a promotional segment for the Speech Department (in which he was active), served as a cameraman on the self-defense film Just Yell Fire, and was even flown to North Carolina to shoot a project for the truck company Freightliner. It was during his time at Clackamas, amidst these other projects and his classes, that Graham’s crowning achievement to date really gained a life of its own. Passion: a movie shot to look like a documentary of fictional events. It was this movie, a tale about Oregon passing a law prohibiting dancing, that premiered at the Hollywood Theatre on Dec. 29. But even Graham’s determination took its fair share of knocks on the bumpy road to Passion. The plot was revised several times as the project expanded, and when Graham was faced with the deadline of his departure for Brigham Young University, doubt mounted. And Graham certainly isn’t one to settle for any screen smaller than enormous. 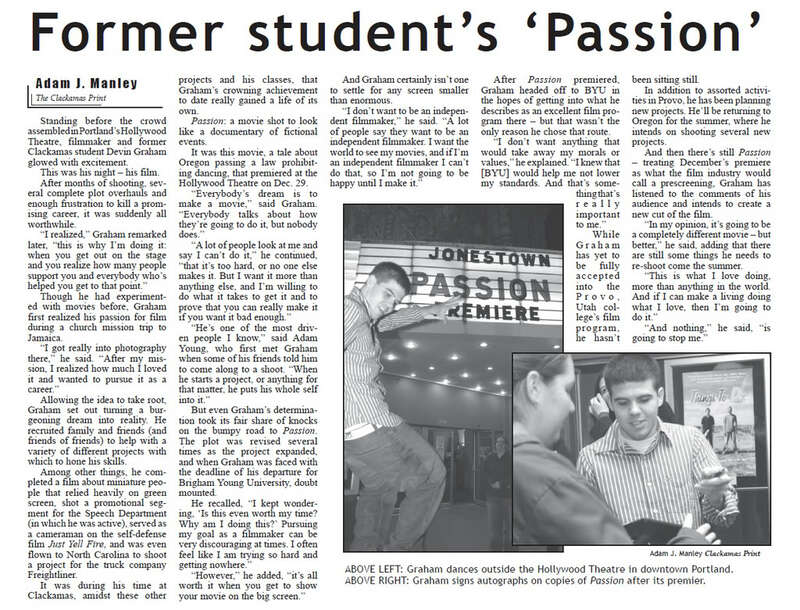 After Passion premiered, Graham headed off to BYU in the hopes of getting into what he describes as an excellent film program there – but that wasn’t the only reason he chose that route. While Graham has yet to be fully accepted into the Provo, Utah college’s film program, he hasn’t been sitting still. In addition to assorted activities in Provo, he has been planning for future ventures. He’ll be returning to Oregon for the summer, where he intends on shooting several new projects. And then there’s still Passion – treating December’s premiere as what the film industry would call a prescreening, Graham has listened to the comments of his audience and intends to create a new cut of the film. “In my opinion, it’s going to be a completely different movie – but better,” he said, adding that there are still some things he needs to re-shoot come the summer. This article was originally published in The Clackamas Print. Below is the original copy. One sentence has been altered from the original for the version above; there was a redundancy in the article that was not caught before the article went to print.